According to worldmeters.info, the current world population is around 7.6 billion people. What is the possibility of a couple discovering years later that they unknowingly met in adolescence? Not that slim, apparently. A married couple in China recently discovered in old photographs that their paths crossed eleven years before they met. Ye and Xue (identified by their surnames in the media) met and fell in love in 2011. They married and had twin daughters. Years later, the couple discovered they met unknowingly as teenagers in the year 2000 when they visited May Fourth Square in Qingdao, China. 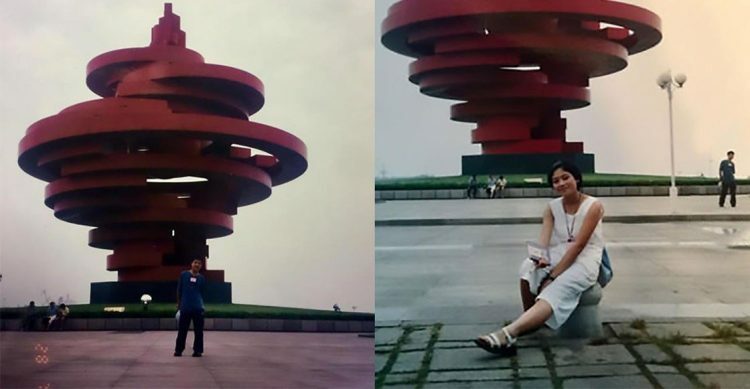 Two photographs of Ye and Xue, both in front of the same red sculpture, confirm they were in the same place at the same time, but didn’t meet. Ye is seen in the background of Xue’s photograph. “When I saw the photo I was taken by surprise, and I got goosebumps all over my body,” Ye told The Guardian. “It seems that Qingdao is certainly one of the most special cities. When the children are older we’ll go to Qingdao again, and the family will take another photo.” Friends of the couple said the photographs are undeniable proof that Ye and Xue were meant to be together.